If you’ve considered straightening your teeth but aren’t crazy about the idea of a mouth full of metal, then we have great news for you. Modern advancements in technology now means many patients can straighten their teeth faster, more comfortably, and without anyone else knowing. Invisalign uses clear aligners to gently guide your teeth into their new position. The treatment plan is designed by computer after your bite is scanned into the software. 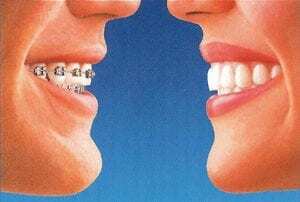 Because of that your bite will be straightened in about half the time of traditional braces. You’ll simply wear a pair of clear aligners for two weeks at a time. When you first put on the aligners they may feel like they don’t fit right. After a few days, they’ll feel more like they fit. That means your teeth have moved into their next guided position. You’ll still need to wear them for the full two weeks so your bone has time to reform around the roots of your teeth again. When the two weeks are up, you simply switch to the next pair of aligners and repeat until treatment is completed. Most cases take between six months to a year. If you’re interested in seeing if you’re a good candidate for Invisalign, you may call our office to schedule an appointment or, if you prefer, you may click here to request an appointment online.